Kalman’s elegant solution of the discrete linear estimation problem has had a major impact in academic engineering circles and in the aerospace industry. Recently, areas of application have widened to include such diverse subjects as transportation planning and scheduling, marine and satellite navigation, power systems, process control, surveying, earthquake prediction, communications, economic forecasting and analysis, water resource planning, human modeling, and biomedical applications. Unfortunately, numeric accuracy and stability problems have often prevented researchers in these diverse disciplines from successfully computer mechanizing Kalman’s algorithms. It has come to be realized that algorithm formulations that involve matrix factorization generally enhance numeric characteristics and at the same time generate new analytical perceptions. Our aim in this monograph is to familiarize analysts in these various areas with those matrix factorization techniques that lead to estimation algorithms that are efficient, economical, reliable, and flexible. In order to expedite their application we have included FORTRAN descriptions of the important algorithms. Our experience leads us to conclude that a better understanding of the underlying mathematics involved with matrix factorization, together with an awareness of the concise FORTRAN implementations that are possible, will result in a more widespread utilization of this technology. Hopefully, after familiarizing himself with this material, the reader will share our opinion. This monograph came about as a result of a set of lectures on leastsquares estimation that I gave at the Jet Propulsion Laboratory. The interest with which these lectures were received convinced me that the estimation applications community would benefit from, and in fact was in need of, an estimation reference book that thoroughly describes those matrix factorization methods and associated numerical techniques that have been successfully employed by numerical analysts. 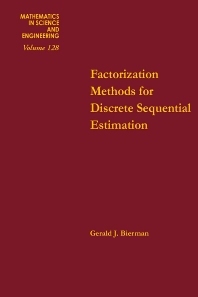 Emphasis in this book has been on the algorithmic and computational aspects of discrete linear estimation. Although our material is of a rather specialized nature, it is of interest to a diverse audience. Our pragmatically oriented and detailed presentation will, we hope, make this book a useful reference.